I have written about the Town of Amherst, NS before and here I am, back at it again to talk about the walking track in their arena and how they’re challenging their residents to use it. Of course, any time you bring people in to your arena, it’s an opportunity for to make a sale for anything from a cup of coffee to game tickets to a jersey from the pro shop. For Amherst, it’s much more than any additional revenue possibilities: it’s part of a quest to make their residents as fit and healthy as they can, developing a strong community spirit along the way. My first Amherst Stadium story was on the domino-effects from eliminating user fees for ALL youth ice activities. That move cost the Town $70K in lost fees, but, on the flip side, it increased participation in ALL the organized youth ice activities and brought more people to the arena. “No user fees” meant exactly that, so when tournaments were being organized, there were no $10 or $12 “passports” being levied at the door for visiting parents or locals who wanted to watch the action. That move also encouraged school spirit since, without an entry fee, practically the entire school would now come out to watch the high school hockey games — a packed house compared to what they’d seen in the years before, where the entry fee stood in the way of support. Bringing more people into the stadium brought more folks to the walking track. Those folks saw other parents and their children using the walking track and, the next thing you knew, the walking track was nearly as busy as the ice below. Walking on the track started to become the thing to do when the parents were waiting for their kids to get on the ice, or waiting for them to get dressed. And they liked it. Soon people started making the walking track a meeting place to get a few kilometers in before work started, or during their lunch break. Or after supper. And that’s when the Walking Challenges began. It may be seem coincidental, but it’s not. It’s all part of Amherst’s Municipal Physical Activity Strategy which wants the people in the town of around 9,500 residents to be part of the healthiest, most active community in the entire province of Nova Scotia. They’re getting there by developing programs with purpose, and on purpose. All events put on by the Town consider the activity and nutritional choices. This makes the activities as attractive as possible to the broadest spectrum of users, and encourages healthy eating choices in a county where 30% of the residents are living in poverty. The activities are advertised through their Facebook and Twitter accounts, and with signs around town and ads on the ice. Pictures of the participants in the variety of organized activities are often shared on social media which gets more shares and re-tweets, and participation in many events is free. All of this is tagged with their hashtag #SeeWhyWeLoveIt – which is rather infectious. I see it on Twitter all the time: since writing about the “No Fee” policy, I’ve followed Amherst’s Parks and Recreation Director, Bill Schurman, on Twitter, and although I’ve never been there, I know there’s always something going on to bring the community together, to participate and be proud of. Becoming, and promoting Amherst as a vibrant, healthy community for everyone who lives there, dovetails into the town’s quest for new business and to support the businesses already there. The town reminds their residents not just to take part and participate in the different activities, but to #BuyLocal whenever they can. It makes Amherst, two hours from Halifax and a stone’s throw from the New Brunswick border, an attractive place to live for potential residents. Last year, Amherst’s biggest walking challenge was to have its residents log enough kilometers to span the width of Canada. This year, they’ve run a couple of mini challenges, like one that covered the distance between Amherst, NS and Amherst, VA, a challenge that lasted a weekend — and was met. 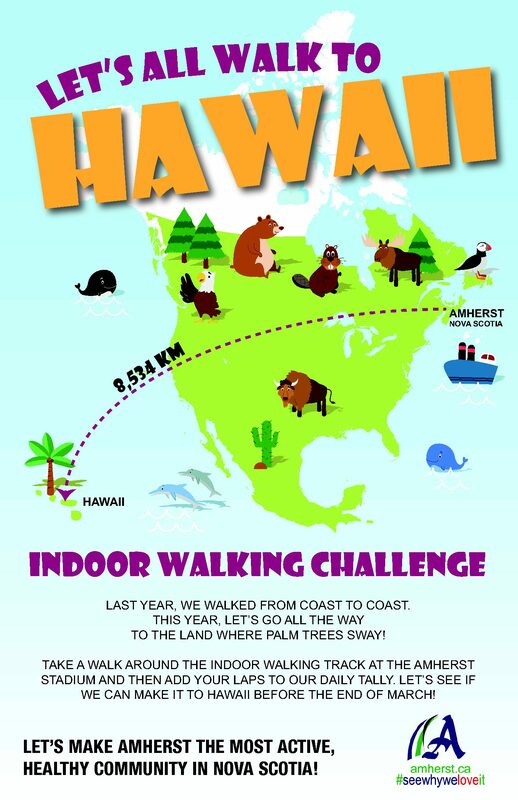 The biggest challenge they’ve ever thrown the gauntlet down for, however, is the one going on now, covering the 8,534 kilometers that separate Amherst from Hawaii. They have until the end of March to achieve this goal of 42,670 laps around the walking track — or about four and a half laps for each man, woman and child in the town. Bill Schurman thinks they’ll reach the goal. As of this morning, they had already passed the 24,982 lap mark. The residents seem to want to make it happen.